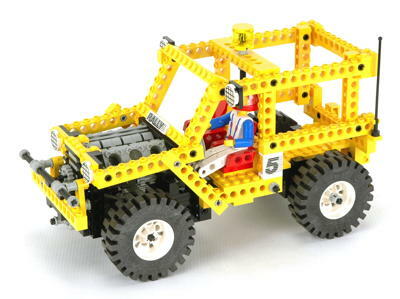 Some major innovations were introduced to the Technic line in 1990 contained within the 6 new sets. 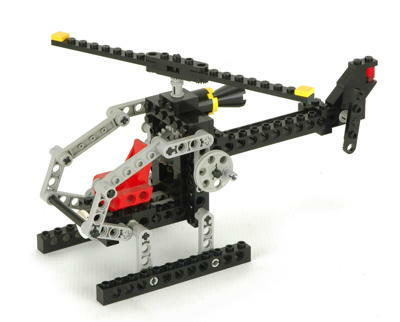 A small helicopter set was released, one of the smallest sets to date, featuring rotating main and tail rotors. 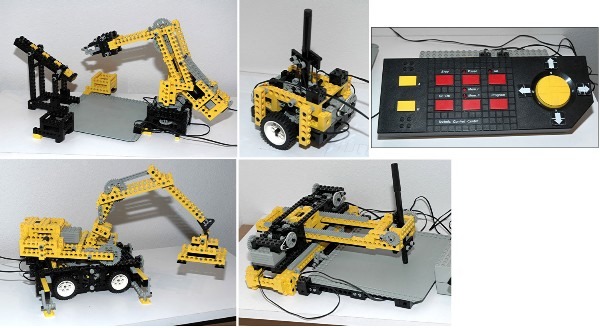 A new universal set contained the new 9V motor system and built 4 different motorized models. The Control Center was a totally new kind of universal set. Rather than a standard battery box, the Control Center system was used which could control up to 3 motors simultaneously (the set came with 2 motors). It could also record and play back commands. 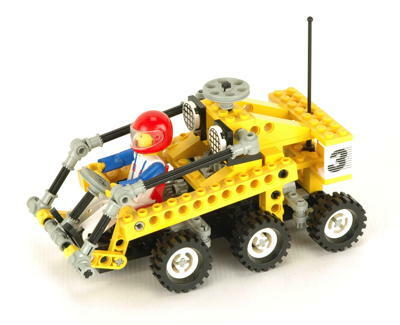 The 4 models constructed from this set are different than anything else in Technic before or since. Finally, there were 3 sets in a new "Rally" series. 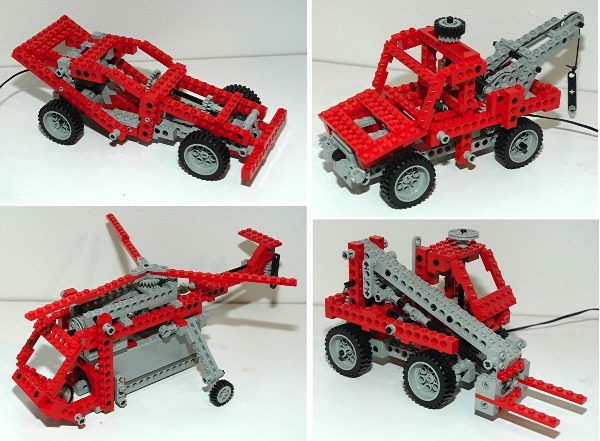 A small 6 wheeled car featured 4 wheel steering. 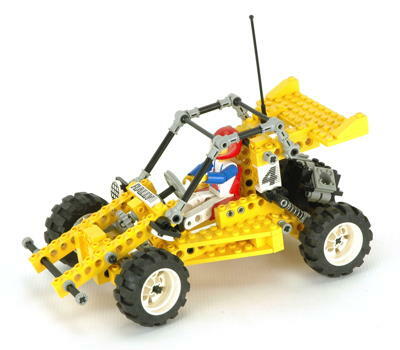 A buggy featured the new engine system and rear suspension. The large truck featured rack and pinion steering and a V-6 engine. The Control Center and the 9V motor system were major upgrades. While the motor has changed a few times over the years, the battery box stayed in circulation for over a decade. The new engine system is still in use today. It contains cylinder blocks, pistons, connecting rods, and crankshaft elements. 1990 saw the release of a brand new motor system. The old 4.5V motor and battery box were replaced with new 9V versions. The new battery box held 6 AA (LR6) size batteries (1.5V) in series and was 4x14 studs in area. There was a single electrical output connection. A rocker switch controlled polarity to run the motor either forwards of backwards. This is a very sturdy motor box although if you ever get corrosion inside from the batteries it will take you a very long time to rebuild it. The new 9V motor was 4x5 studs in area with a single axle output. Typically a small toothed bushing was used as a pulley on this output. This is a high speed motor which requires significant gear reduction to be used for any useful function. A new blue belt was typically used as the main drive system from the motor. Use of a belt allowed the motor to slip rather than stall if too much torque was applied. Unlike the old rubber bands, this belt was not made from rubber but some other type of elastomer which does not degrade over time when installed under tension. There was also a smaller white belt. The new electrical wires (not shown) used a 2x2 plate with 4 contacts. This connector was specifically designed to make sure that it could never be shorted. The polarity of the motor could be reversed by rotating the connector 90 degrees. The new black friction pin looked very similar to the old. The major difference is that a longitudinal slot was added which makes the pin compress slightly when installed. This makes it much easier to remove than the old variety. This part would become a staple of Technic construction up to the present day. 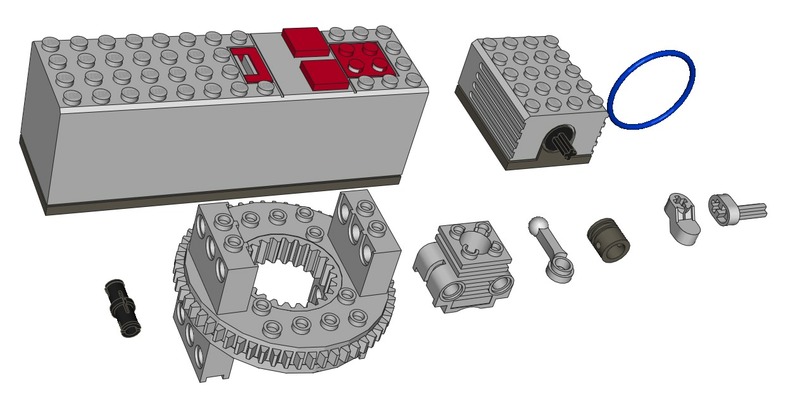 There are probably more of this part in Technic sets than any other. A new turntable was introduced as a vast improvement over the old 4x4 circular variety. It was a large diameter and featured both an internal (24 tooth) and external (56 tooth) ring gear so it could be driven by gear systems on the model. The internal ring gear was attached to the lower half of the turntable, and the external ring gear to the upper. The internal ring gear was the same size as a 24 tooth spur which fit perfectly inside. With 6 pin holes on the top and the bottom, it could support significant weight. It was used on many of the larger sets for many years. While the old reciprocating engines had a unique 2x2 piston part, the rest of the engine was made with standard parts. That changed in 1990 with the introduction of a whole new engine system comprised of parts designed to work together. This system would be used on a wide variety of sets for decades. A 2x2 cylinder block featured a round bore and simulated cooling fins on the exterior Two pin holes on either end were used to mount it. A round piston fit snugly inside the bore of the cylinder and had a spherical ball receptacle on the lower end. The connecting rod has a ball joint at the top and a hole at the bottom. The rod was offset 1/2 stud width so that opposing pistons could be aligned in the same plane, something which was not possible with the old engines. A crankshaft end piece had an axle on one end and an axle recess offset 1/2 stud on the other end. This allowed a crankshaft to be constructed with a 1 stud stroke. A central crankshaft piece had an axle recess on either end offset one stud with. It was used for engines with more than two cylinders requiring a longer crankshaft. 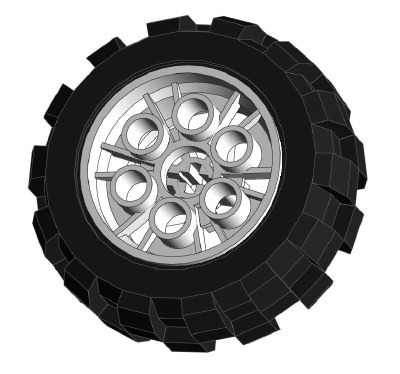 A new 20x30 solid foam balloon tire was introduced which fit on the existing 20x30 wheel.